This isn’t a post with answers. This is a post with questions. 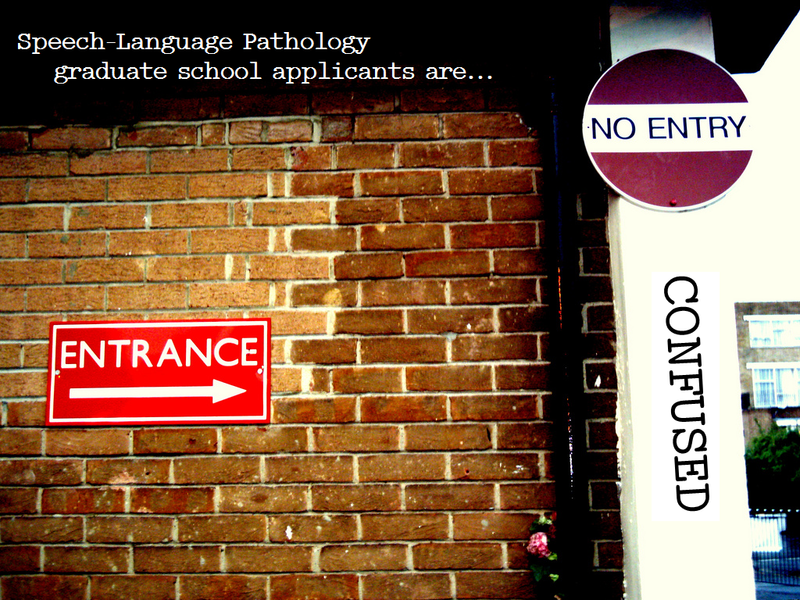 Questions to add to the already mounting questions other SLP Graduate school hopefuls have after filling out an avalanche of applications. See the requirements for applications – 3+ letters of recommendation, resume, letter of intent, essay, application form, all your money (approx $3.8 million per school…approximately). Wait for what seems like eternity. Usually 1-4 months. Receive rejection or acceptance email/letter/pigeon – Rejoice! or Weep in a pool of tears. Can this process be streamlined? Can we have one application portal? Can we can submit the same basic info through a universal portal, then tailor other things like essays and letters of intents? Can we have more consistent entry requirements? Can ASHA put suggestions out there? Like having a 300 total GRE score, a 3.5 GPA, or something? Who should these questions be addressed to? Who would be able to streamline the process? Will this process ever change? What are your thoughts, readers? Am I crazy? Thank you for writing this! I’m going through my first round of applications right now (finishing up, actually!) and have been completely overwhelmed and disheartened by the process. It is EXPENSIVE, confusing, and stressful to have to bounce back and forth between applications and just try and keep each schools’ requirements straight in my mind. I’m not sure what can be done to make this process more efficient, but it is definitely something ASHA and the universities should discuss! First, CSDCAS is exactly what you’re talking about when you mention “streamlining”. It offers a way to upload separate essays, send in GRE scores, transcripts, fill out a “resume” (think of all of the components of a great resume: extracurriculars, research experience, publications, etc – there’s a way to input all of this info in! ), course history, GPA, etc! Not only is it easier (one set of instructions backed by one organization of people who run the site – not 10 different program directors), but it is CHEAPER! (Only need to send in one GRE score/transcript for CSDCAS, no matter how many schools on there you are applying to). In simplistic terms – I explain to others that CSDCAS is like a personal webpage where it has all of your stats, info and essay on and then you pick which schools (and pay per school) can have access to it! I had NO issues at all through the CSDCAS process.. I highly recommend it! The only downside is that not enough programs utilize it! As far as fees go, I payed around $1,500 for this process. That includes 2 GRE sign ups, 2 sets of scores being sent to my 9 schools, 2 or 3 (community college + undergrad + potentially an “academic update” aka Fall 2013 grades even if your app was submitted before these grades were posted) sets of transcripts to my 9 schools, plus applications (and postage) for said 9 schools. Some schools I had to pay twice for (one to apply to the graduate school, the other to apply to the actual program), which personally seems like a waste. – Know what schools you want to consider applying to when taking the GRE. Once you’re done with the test, you get some free scores sent. This worked well for me, but I know some students who had no idea where they’d apply, so they sent the scores wherever and then had to pay for each score to be sent. Sounds confusing, but look into the GRE website for more info on this..
– Talk to your program adviser/professors. At my school, our adviser is THE BEST! She is straight forward when it comes to “reach”/”good fit” schools. I brought her a list of schools and she basically told me to pick more safety schools. I did not get offended at all, but appreciated the help! I’d rather spend money on a program I have a chance of getting into versus a program that wont look if you don’t have a ___ on the GRE. Also, when I asked my professors for letters of rec, I asked them where they went and what they recommended for me. One of my professors made something very clear to me, which helped a lot. Yes, I may have a better chance at getting into a school not in the midwest (where I am now, it is heavily populated with SLP2B’s ) but if I’m a student who needs a lot of support from family or friends to keep going on those stressful days, think long and hard about that programs potential for you. – Be organized! I kept a log of EVERYTHING I did, the date and how much I paid, and that was very helpful! Some schools I didn’t even remember doing things for and then I could look it up and see the date I completed it! Half of the struggle is getting your application components done correctly/on time. – Send everything in EARLY. I haven’t had any issues, but I have friends whose transcripts didnt get received on time, letters of rec getting lost in the mail, etc. The earlier everything is done and mailed/sent, the earlier you can begin to contact programs about missing information. Some programs will send you a “You’re missing this…” or a “We received all of your application materials” (Thank you if you are a school that does this… Life saver…) but others will not. I appreciate this post because when I begun this process, I thought to myself “SLP’s are Type A personality people… Why isn’t there an organized and simple way to apply to these programs!”. We find out results typically in March/April, so keep your fingers crossed for us, SLP2B’s! I’d love to hear some insight from others! One day..maybe all university applications for SLP grad school will be on this system. That’s my hope! I can greatly appreciate the added stress that tracking multiple requirements creates in this process. As Elizabeth noted, CSDCAS is an effort to help reduce this stress nationwide. Individual programs elect to participate and a list of participating institutions can be found by checking the CSDCAS website. What this means for students is that they may or may not need to file multiple forms with the same university or the forms they file for each university may look different. This isn’t meant to defend the practice necessarily, but at least to provide a little perspective. Universities have thousands, sometimes tens of thousands of graduate students all of whom need to be tracked by a number of different units across a university. In the same way that having a centralized application process for CSD applicants would be helpful, a single platform for universities to communicate internally would also be good. Unfortunately there are a number of barriers to go into related to that and I don’t wish to hijack Katie’s blog any further. THANK YOU John. Perspective is always appreciated. I sometimes get so frustrated on behalf of hearing others’ stories. I forget faculty at Universities have their own view of it all. So glad you chimed in! Believe me it would be nice for things to be simpler on the CSD program end too.